Monoclonal antibodies (MAbs) are currently the major class of protein bio therapeutic being developed by biotechnology and pharmaceutical companies. 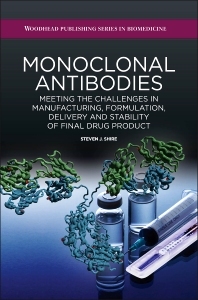 Monoclonal Antibodies discusses the challenges and issues revolving around development of a monoclonal antibody produced by recombinant DNA technology into a therapeutic agent.This book covers downstream processing which includes design of processes to manufacture the formulation, formulation design, fill and finish into closure systems and routes of administration. The characterization of the final drug product is covered where the use of biophysical methods combined with genetic engineering is used to understand the solution properties of the formulation. The latter has become very important since many indications such as arthritis and asthma require the development of formulations for subcutaneous delivery (SC). The development of formulations for IV delivery is also important and comes with a different set of challenges. The challenges and strategies that can overcome these limitations are discussed in this book, starting with an introduction to these issues, followed by chapters detailing strategies to deal with them. Subsequent chapters explore the processing and storage of mAbs, development of delivery device technologies and conclude with a chapter on the future of mAbs in therapeutic remedies. Students in the pharmaceutical sciences as well as industrial pharmaceutical scientists. How is viscosity measured experimentally? Steven J. Shire is currently consulting and serving as an adjunct faculty member of the USC School of Pharmacy and University of Connecticut School of Pharmaceutical Sciences. He was at Genentech for 32 years where the majority of his career was in the pharmaceutical development department. He retired in June 2013 as Staff Scientist in the Late Stage Pharmaceutical Development Department. He has been responsible for directing research and development of formulations for a variety of recombinant human proteins including Pulmozyme® and Xolair®. Dr. Shire has served as the chair of the American Association of Pharmaceutical Scientists (AAPS) Biotechnology Section, and was elected as a Fellow of AAPS in 1998 and member at large to the AAPS Executive Council in 2001. He has published over 80 reviews and papers dealing with various aspects of formulation and pharmaceutical development of therapeutic proteins.